What is Supported Holiday Travel? You may have been working with your support assistant at Beacon Support and have heard ‘supported holiday travel’ mentioned a couple of times. But what is supported holiday travel? When you and your loved ones want to go away on a holiday, your support assistant from Beacon Support can travel with you and provide the high quality of care you are used to. Whether in a hotel, in another country or just down the road from your house, the professionals at Beacon Support provide you with supported holiday travel. Holidays should not disrupt your routine, but rather, your care should help you discover the world around you from beyond your home. Supported Holiday Travel allows you to travel with confidence. 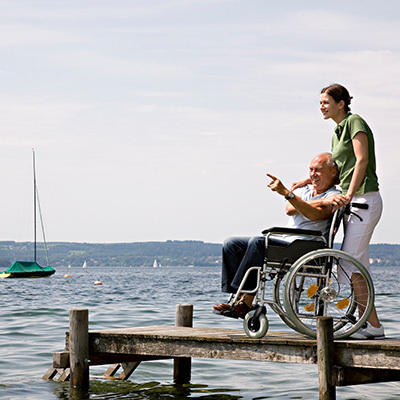 Our staff will help you identify methods of transportation are best suited for your condition, help you to find accessible lodging options as well as be by your side each step of the way. You no longer have to leave your professional care assistant behind. Our supported holiday travel team will help you overcome any challenges that may arise from your travels as well as ensure that your medication routines and other health care professional subscribed tasks are not disrupted. Your illness or disability does not have to limit your ability to see the world from beyond your house. Whether you utilise a wheelchair, have a vision impairment or are suffering from a long-term illness, there is a holiday available to you. Holidays range from a night away in a new town or city, to a coach tour or to a cruise! Your Beacon Support professional can help identify options that suit your condition the best and work with you to ensure this holiday can be all that you dream it could be. Beacon Support is registered with the National Disability Insurance Scheme which allows you to access funds in bringing a Beacon Support professional along on your holiday. Our staff will help you claim these costs through the portal and ensure you have the paperwork required to access the funds. Our staff at Beacon Support can act not only as your travel agent but also as your support care provider so your holiday will be created to fit you perfectly. We are able to help you customise the support you require to ensure you have the best time on holiday with family and/or friends. As your holiday will be unique to you, it is best to chat in person with one of our professionals on how we can assist with your supported holiday travel and the funding available to you. Call us today and let’s start planning your holiday!